I’m an admin for a Facebook Squeeze group and was provoked by a member who wanted to know what time Glenn Tilbrook would be on stage on his latest tour. “I’m not interested in support acts”, he said. That got me to thinking about all the group members who had seen Squeeze first as a support act; in fact who had seen Squeeze when they had been third on the bill and played before Eddie and The Hot Rods and the Radio Stars. Then I thought about all the brilliant support acts who I’d seen with Squeeze (I’m someone who always wants to see and hear the support – it’s all about the live music experience, isn’t it?). Who was Glenn’s support act this tour? Charlie Austen; no, not the footballer, it’s Austen with an ‘e’. I missed seeing Charlie at Glenn’s gigs so I’m delighted to catch up with her at The Hub in Plymouth as, you guessed it, a support act – this time for Nine Below Zero, although, as she says when she takes the stage, “You might recognise me because I’m in Nine Below Zero.” There’s a palpable sense of pride in her voice. At the end of the gig I manage to buy a copy of her CD. It’s a collection of ten songs all recorded live. The Nine Below Zero fan next to me says, “She’ll never be successful releasing a live album as her first album,” with an ironic grin, and then I remember Nine Below Zero’s first album was Live At the Marquee in 1980. It’s nice to know fans of every band have their ‘in’ jokes. 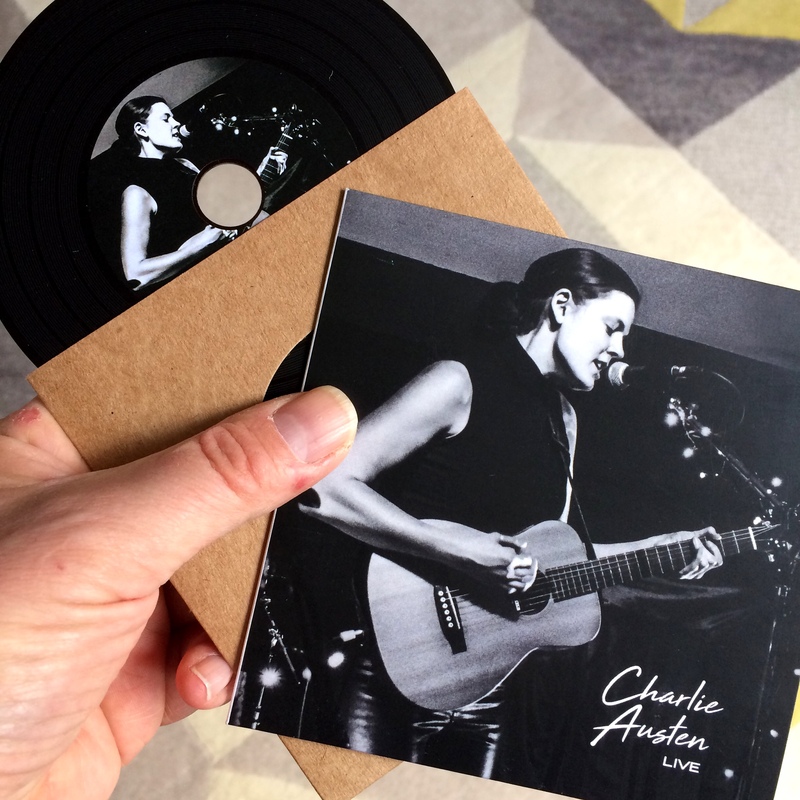 What’s the CD Charlie Austen Live like? It starts with Little Yellow Birds with a lively cartoon metaphor for falling in love. The guitar work is dizzying with glorious harmonics, and her voice soars. The arrangement is so sparse and yet inside the song is a huge arrangement just dying to be let out. It’s impossible for just one guitar to play all the parts or convey the changes in rhythm in such a great song; it needs a twenty piece orchestra to do justice to it and to her voice. It ends with a glorious jazz chord. This is someone who’s not just repeating the words but is living them in her imagination as she sings them and is using her technical mastery of vocal phrasing to give them full meaning. It’s the thing you can’t describe but everyone understands when you say, “You know, like Sinatra does”. The crowd-pleaser The Ballad of Sputnik has Charlie’s trademark breathy vocals to the fore. Cold Hard Money has traces of Fairground Attraction’s Perfect; and you can’t choose a better songwriter than Mark E Nevin or a better vocalist than Eddie Reader. The rest of the album is sparklingly original. Some of the songs seem so personal, so confessional, that I shudder to think what might have inspired them, like the larger-than-life characters which inhabit Copenhagen. The CD ends with a thing of tiny, wonderful, beauty, the endlessly romantic Wonder With Me. Support acts huh! Who’d see them? Here’s a taster from Soundcloud. My advice? Always see the support act. They could be Charlie Austen, and that would be just marvellous. Charlie Austen Live – dizzying guitar, soaring vocals and classic songwriting, all in one person. Highly recommended. 3 Responses to "Who is Charlie Austen?" Wonderful review of a wonderful artist. Saw her twice with NBZ on the last Squeeze tour and twice solo with Glenn. Amazing every time. Beautiful voice, stunning guitar work and a beautiful album, She’s back in Glasgow supporting NBZ in December 2018, tickets bought already. “Don’t do support acts” well what a plonker. Your loss pal. They probably all have more talent than this guy will ever have and Charlie is no exception,great voice,great muscian and a great person. I know this because I have seen and met her,unlike Mr plonker.